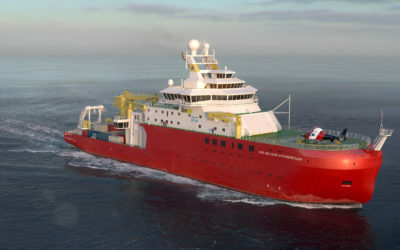 RRS Sir David Attenborough will be equipped with enhanced satellite communications and data processing and storage systems to meet the increasing requirement for data-intensive operations (including operational forecasting). 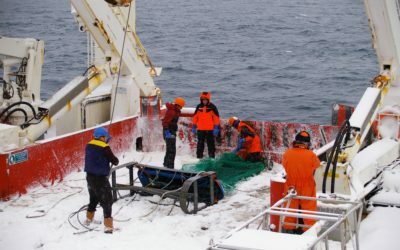 The ship’s telephone and PA network, SeaQNet, is part of the BAS Cambridge network. This means that all telephones on the ship will have an internal BAS telephone number. 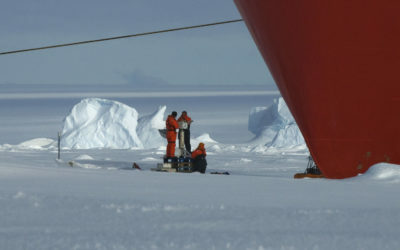 Communications will take place via VSAT satellite; the bandwidth will initially be 1.5-3 Mb/s, approximately double that available on RRS James Clark Ross. Aboard ship, WiFi will cover all locations (including cabins) on Deck 3 and above, with some locations on Deck 2 also covered. The vessel will operate a system called SDANet, with a 10 Gb/s server connections and 1 Gb/s connections to desktop computers. Approximately 900 network ports will be distributed around the ship, and SDANet will be used for most communications with instruments aboard the ship. There is uncommitted scientific wiring available on the ship for use in future applications. The RRS Sir David Attenborough will have a total of approximately 180 24-inch display screens distributed throughout the ship. This includes large video walls (2×2 and 4×3 screens), which can be used as a single large screen or split up, as well as 2- and 4-screen operator workstations in the main lab and winch control room. Each lab space will also have several display screens. There will be more than 30 sources for these displays, including the ship’s navigation systems, bridge displays and scientific computers. The video walls and operator workstations have fibre optic cabling which allows for future upgrades to 4k usage. The single displays will initially operate using copper cabling which can support full HD (1920×1200) resolution and may also be upgradable to 4k. While RRS James Clark Ross produces up to 3TB of data per research cruise, the new ship will have significantly more instruments and expanded scientific capability on board. As such, the amount of data generated is expected to be significantly greater, up to several 100 TB per cruise. Data logging systems with sufficient capacity for logging information from stream-based devices such as meteorological, oceanographic and navigational instruments will be installed on the ship. There will also be a central file server for instruments such as swath bathymetry, fisheries echosounders and the ADCP.